This is actually a barber shop for kids(who cant sit/walk). The babies are actually sitting on the basin bottom and the float supports their shoulders and head - so barber can cut their hair without them flopping around. HOOPLA...A Prize Every Time !!! This is why they always have their eyes that way. Babyhead mizo soup! My favorite! saves a lot on diapers? They aren't crying because of a lack of blood flowing to their heads. I bet on the green !!! 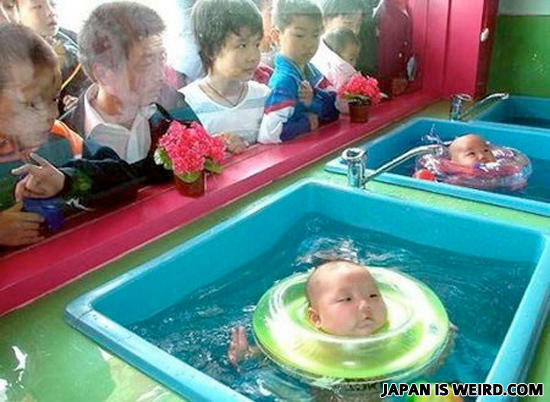 i thought they are training these babies to swim so they can save themselves form drowning?? My family is chinese, and my mom says this is normal... WTF??? I wonder if it comes in yellow ? -music- how much is tht baby in the window?